Books. I own some. I've borrowed them from the library. I've ordered them online. I've listened to them "on tape" (kids, that's how we used to listen to Audible before the internet was a thing). So I'm a fan. And you should be, too, because "reading is fundamental" and other catchphrases from public media campaigns over the years. Hey, if a big red dog says we should read, we probably should. Hell, I don't want to alarm you, but you're reading right now. The million dollar question is: Nicole, what should I read next and will you be in that book? 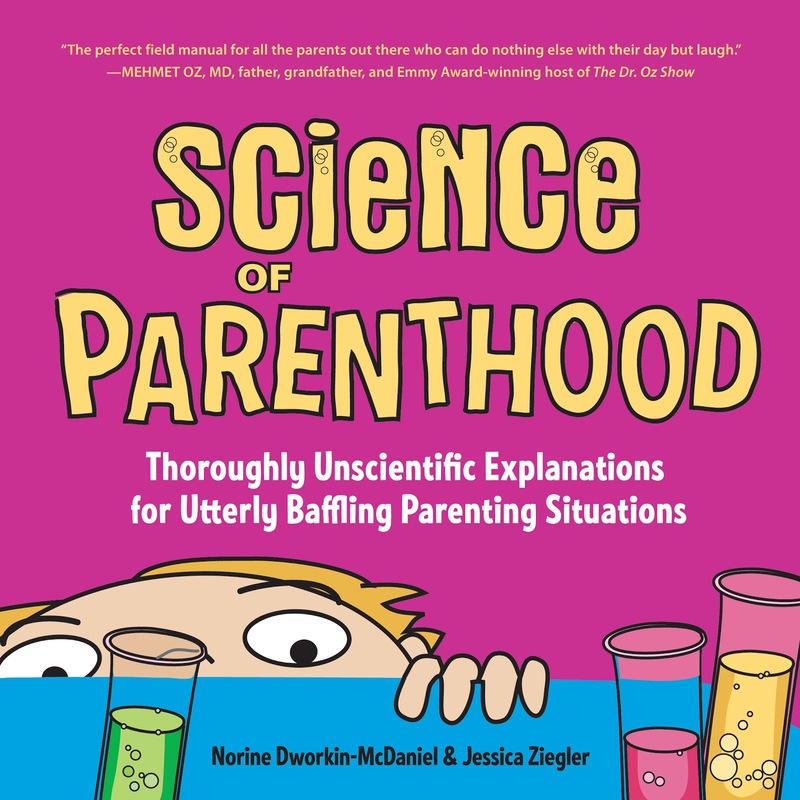 The answers are Science of Parenthood: Thoroughly Unscientific Explanations for Utterly Baffling Parenting Situations and no, I'm not in that book, but it's probably good anyway. 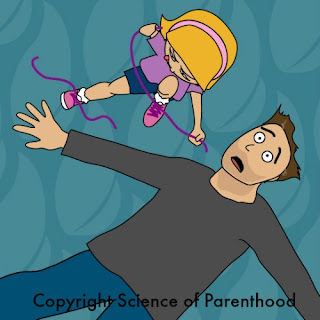 But I am in The Bigger Book of Parenting Tweets: Featuring More of the Most Hilarious Parents on Twitter, which, along with the first edition of The Big Book of Parenting Tweets, are creations of the same comedic masterminds behind the new Science of Parenthood book. In other words, it's sure to be funny. Even without my contribution. But don't take my word for it (Reading Rainbow reference, if you're following along). I've interviewed Jessica Ziegler, the artist behind all three books, to tell us all about this newest creation brought to life by her and her writing partner, Norine Dworkin-McDaniel. Nicole Leigh Shaw: So, books are still a thing and you've published one? Jessica Ziegler: Yes! It’s called Science of Parenthood: Thoroughly Unscientific Explanations for Utterly Baffling Parenting Situations. It’s available now! Thanks so much for doing this interview, I’m excited to talk to you today about the book! NLS: This is your third book, right? Because I'd like to point out that I was in your second book, The Bigger Book of Parenting Tweets that you published along with Norine (your Sun and Stars), and the Twitter maven Kate Hall. And I'd also like to point out that I was not in the first book and am I right to assume it's because you didn't want to shame the other contributors with my Twitter prowess? JZ: It’s true. You weren’t in the first one. I blame Kate. The first book came together very quickly, and we didn’t have time to open submissions, which is why you weren’t in it. You weren’t even given a chance. If you were, I’m sure you would have been in it, I’m positive. NLS: Well, your kingdom for a Flux Capacitor, am I right? 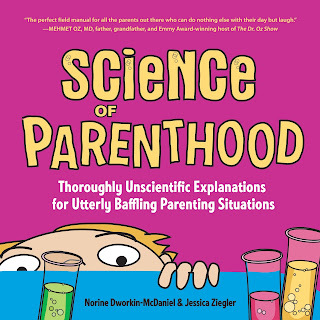 What's different about the Science of Parenthood book, other than I'm not in that, either? JZ: This book was actually written by us. We wrote bits and pieces of the Tweets books but the humor heavy-lifting was done by the contributors, such as yourself. 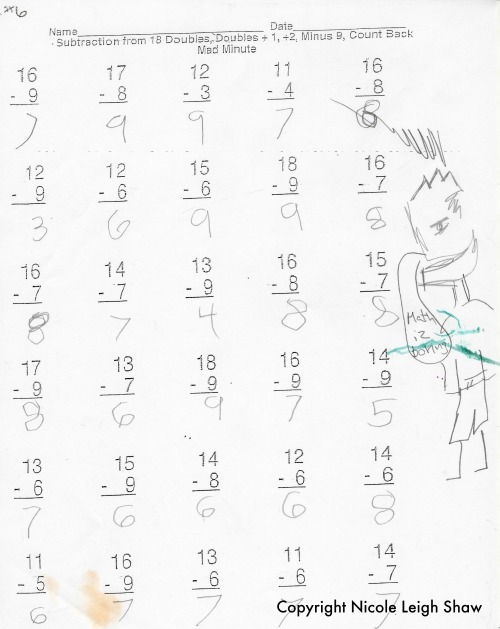 In the new book we use math and science as a humorous lens through which to poke fun at everything that is maddening about parenting: unexpected diaper blow-outs, food tantrums, homework, etc. It’s full of our cartoons, as well as humorous essays, quizzes and fun science-y charts and infographics like Should You Have Another Baby and Where’s Your Phone? NLS: How did you contribute to the new book? I understand you doodle. JZ: I do. 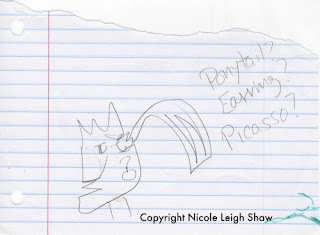 I’m a well-known doodler with an BFA in Painting. I illustrated the cartoons and other elements in the book, designed the cover and interior, and designed (and wrote most of) the charts and infographics. Norine did some things, too, I think. I don’t really remember. NLS: Have you always wanted to be an artist who made cartoons about parenting? 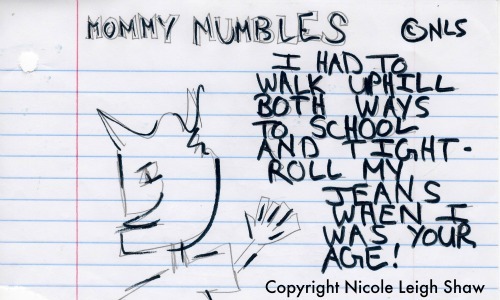 Like, at age 5, were you taking notes on your mother's behavior and sketching her holding a coffee mug and cursing under her breath? JZ: No, though I should have been taking notes. I grew up with two younger brothers, so I really missed an opportunity to hone in on multi-child dynamics. My father is a cartoonist and, frankly, I always thought of that as his “thing.” Honestly, this is all Norine’s fault. NLS: Did you know that I wanted to be an artist, too, but I'm from a broken home, so that's why I'm a humor writer instead? JZ: I’m sorry to hear that, though I don’t think being from a broken home precludes being an artist. Could you not afford crayons? NLS: Would you like to see some of my work or are you afraid I'll be a better artist than you are? JZ: I’d love to see your work! 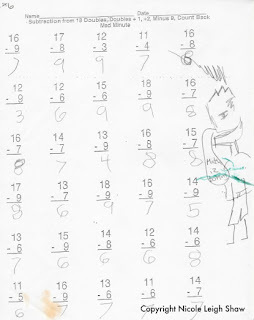 NLS: Here's my first sketch, I was inspired when I was helping my kids with math worksheets. It's okay to cry if you feel moved by the raw emotion. JZ: Well. Yes. It IS very raw. That is an excellent word to describe it. NLS: I know you didn't ask, but here's my next sketch where I really start to explore the essence of my character. Who is she? What motivates her? Does she wear earrings? I'll understand if you want to clutch your stomach because my talent has hit you like a punch to the gut. JZ: Wow, that is something alright. NLS: I like how you're restraining your praise, very profesh. Now, here's a piece I started to develop when my art became craft, and not just a hobby. 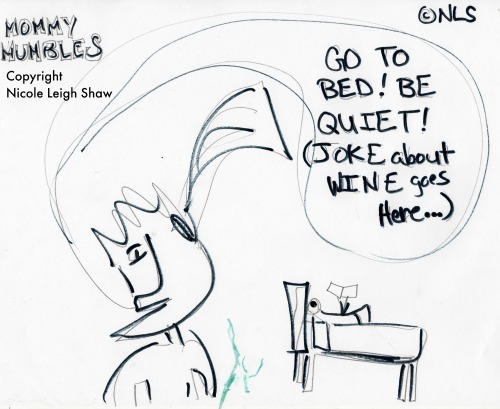 Don't worry, your cartoons are coming along and soon you'll also be a member of the elite guild of creators called cartoonists. Just keep trying, Jessica. NLS: I'm a patron of the arts, Jessica. It's my job to help foster less talented people, like yourself. No need to thank me. In fact, I've added one of your pieces of work here, titled Special Shoelace Relativity so that we can show my readers how nicely you're coming along. How long did this piece take to finish? Hours? Days? JZ: Oh, geez, I think maybe an hour or so? Speed isn’t really the first thing I’m thinking about when I’m drawing. I remember it took a bit of time to figure out how to show the girl from above, it’s a bit of a tricky angle. NLS: That's nice. I drew this in under 4 minutes. I know. You can't even believe what I'm saying right now. JZ: Four minutes seems about right. NLS: What do you think of my most recent work? It's just something I came up with one day, kind of just hit me. One never knows where inspiration comes from. JZ: Well I have to say, that one is very familiar. 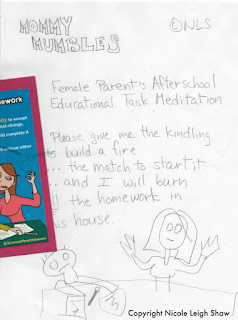 Surely you remember the Mother’s Homework Prayer that we published last year? You must, part of it is right there in the picture. NLS: I'm pretty sure you're mistaken. This is not a "hacked kind of plagiarism that only the lazy and untalented would call art," as you just mentioned in the voicemail you left on my phone. I saw something like this on the internet and we all know that art and graphics and memes you find on the internet have no copyright protection and you can take it and do whatever you want with it. NLS: I'm sorry you didn't feel it necessary to respond to my last question. With an attitude like that, I honestly don't know how you'll sell any books. If you think you can get by on hard work and talent, well, I'm afraid you'll be very unsuccessful, indeed. But, if the rest of you think Jessica and Norine are, in fact, talented, you can buy their book and follow them online. 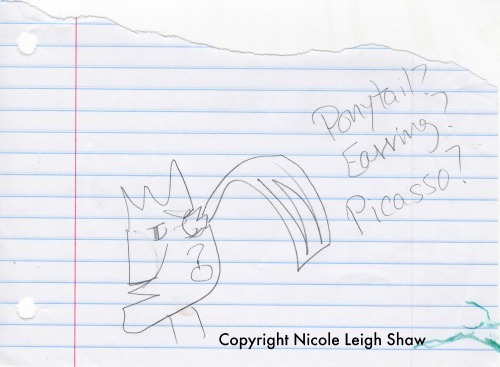 As for me, I'm feeling good about my chances of making it as an artist.